Raumfahrtaufgabenübertragungsgesetz is a new Nintendo DS demo by St. Vincent and the Grenadines, released at Nordlicht 2018. Don’t get irritated by the long German odd name of the demo, it’s worth your time. 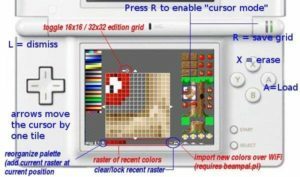 GamEditorDS is a collection of developer tools for game-making on and for the Nintendo DS including content uploader, level-, sprite- and animation editors along with a 2D game engine supporting sound/music. If you are interested in getting Nintendo DS development startet, mabye this is for you! Belgian developer Pype still gives love to his long term Nintendo DS homebrew game project School Rush. Help Bilou, a blue, ball-shaped explorer to stop an evil gauge haunting a school. You can jump and grab things but also stomp some monsters. Your goal is to reach the right of each level before you’re caught by the ever-raising ink. You’ll need to be quick, too. Use (R) or double-tap in left/right directions as if you were a pink, living vacuum cleaner. 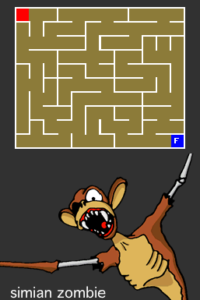 Amy Zing and the Amazing Mazes is little maze solving game by Ant512. The game is loosely based on the snail maze built into some revisions of the Sega Master System BIOS but it isn’t a remake. Like the snail maze, the objective is to guide the red square through the maze from the starting point to the finishing point. Homebrew developer Benjamin Allion has relaunched his homepage. He made a couple of great PSP homebrew games such as GoGoGoo and Arc-Angel and developed his own Nintendo DS RPG engine. Crazy XMAS is a homebrew game for Nintendo DS by Benjamin Allion. It’s a run and gun game where you have to shoot penguins. – Savegame management has been modified to prevent corruption as reported by some. – Autosaving is laggier due to the above. Consider turning it off. – A “single-screen mode” has been added. Thanks to http://nintendomax.com/viewtopic.php?f=19&t=16151 for the news. If you like Space Invaders you may like this back to the roots style version by Ant512.